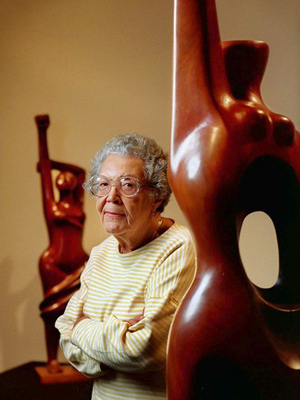 The Shirley Chisholm Project remembers Elizabeth Catlett, a sculptor and printmaker who died at her home in Mexico at the age of 96. Catlett's decision to focus on her ethnic identity, and its association with slavery and class struggles, was bold and unconventional in the 1930s and '40s, when African Americans were expected “to assimilate themselves into a more Eurocentric ethic,” art curator Lowery Stokes Sims said in a 1993 National Public Radio interview. Confident that art could foster social change, Catlett confronted the most disturbing injustices against African Americans, including lynchings and beatings. One of her best-known sculptures, “Target” (1970), was created after police shot a Black Panther; it shows a black man's head framed by a rifle sight. Catlett was at one point barred from the U.S. during the McCarthy era for over a decade because of her political activism in Mexico, after she was arrested during a railroad workers protest.